Ah, Monday: it's really quite nice to see you. I have a list of things I'd like to do this week and I'm hoping you are going to help me to get started. We had a free wheeling kind of a weekend. Sometimes I approach Saturday with a cunning plan (sshh..don't tell the others..): a hope that if I plant the seed of an idea in a few heads here, we'll end up on an interesting trip and I'll have plenty that's new, for a Monday report. But there are weeks when the seeds are hard to come by. This was one of those weeks, when I'm still waiting for the papers to arrive on Saturday morning in the hope of spotting an inspiring something. I took my knitting outside. I flicked through instagram; and - surprise! - I discovered two new things straight away. Two: the monthly craft fair we often enjoy had been brought forward a day. So I took a quick instagram picture of my outside knitting, which isn't exactly "in public" but was the most I was going to try for at such short notice, and we headed off to the fair. I always like browsing the stalls; but they were much the same as always, so we strolled to the bookshop (I bought a book but I'm supposed to be saving it for my holidays. Because I already have a stack by the bed) and then started for home, passing a brace of Stormtroopers on the way. Lookin' good, guys. Wait! What! Stormtroopers? My radar had failed again! If I'd known about the Role Playing Conference in town this weekend, just think, I could have been mingling with the Marios. Maybe. A bar room brawl in the middle of nowhere? A herd of music hating cows just arrived in town? Some of the keys still played, which was strange and a little sad. It must have a story, don't you think? A good one, with an adventure. But for now, it's my "thing I've never done before" for this week. I've never watched someone play part of a piano, in a field, late one Sunday night. So that's a memo, then. How about you? Anything you learned that you didn't know before? Anything you did for the first time? Maybe it's time to make a memo. Because it's Monday. Last week Eileen, Mary-Lou, Ladkyis Fiona, Helena, Ruth, Deb, Maggie, Susanne and Mitra made a few notes. Go on, give 'em a wave! Go wish them a good week! 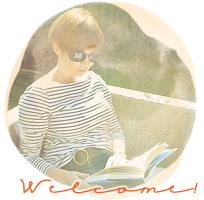 And if you are joining in here (and you are very welcome), please stop by and say hello, then I'll know to add you to the list of memo makers for next time. Have a good one! What a weird find! So many possible back-stories. Party in a field? 'Round NI with my piano'?Fell off the back of a lorry? And I can't see it without hearing the noise it would have made - like something from a Laurel and Hardy film! What did I learn? That my sister + Mam wished I'd gone on a city break with them. They said they wished I been there to help them decide what to do / where to go and make plans OR to just shout at them 'this is what we're doing'! Nice to know how other people see you! Well the stormtroopers made me smile, but the abandoned piano turned it upside down to a frown. I certainly hope it took a tumble by accident, and not for any other reason. It was a quiet weekend here too, with family all round for Dad's day. Quiet works for us! Have a good week, Sian. Oh golly, that's a sad sight ... There must indeed be an interesting back story. Mind you, your white-suited adventurers is equally in the you'll-never-guess-what-I-saw frame. Knitting in public sounds like a grand theme for this time next year! I am sure these relaxing no-revision evenings will be much appreciated and remembered with fondness in years to come. Only thing that could have made your back stories perfect, was if the Storm Troopers were in the field with the broken piano, playing it. Such a sad end for a beautiful musical instrument - I wonder if it fell off a moving lorry (van)? Looks like a bit of fly tipping to me. We get a lot of it around here. I think that piano does look particularly sad neglected like that. Reminds me of some fly tipping I saw a while ago where there was a large framed photo of two children. My imagination went into overdrive. Who would throw out a lovely picture like that? Is it a house clearance of a deceased grandparent? Some rogue had certainly left in down our lane. 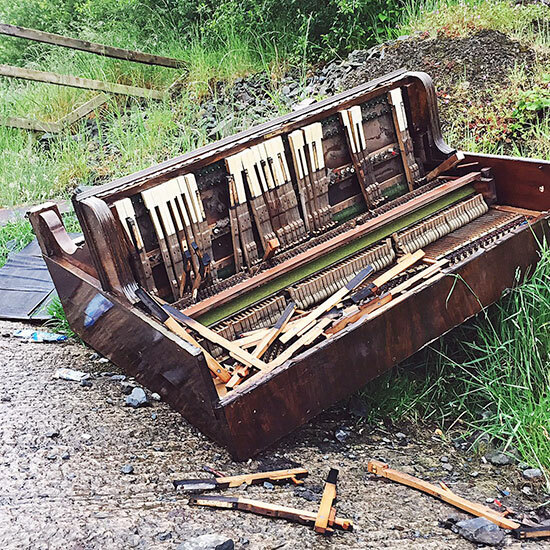 Perhaps this neglected piano has such a story. If it could only talk! Woo-hoo! Look at me! I can leave a comment again! :o) (Thanks for fixing that!) The piano on the side of the road must have been a real sight! It reminded me of a time when my brother helped me move some furniture and we neglected to tie everything down. We lost a really nice chair along the way, and I imagine that's what happened with the piano. What a sad sight to see though! These photos are great... so random. Too bad they don't fit the criteria for the summer photo challenge. I did not know that there was a knitting in public day. That would be great if we all posted photos next year! Glad to hear there was relief from exams. Hope they are over soon. Now there's a mixed bag! Good luck with saving the book - weird seeing storm troopers & oops about the knitting day !!!! Oh, I have a boy here who would have loved to stumble across those storm troopers. The piano is such a sad sight, but what stories it might conjure up. Hope exam season is going well. Nearly there now. I'd love to know the back story to the piano! And that photo of the stormtroopers is just an amazing find. Hope the exam pressure has eased off now - roll on Summer! 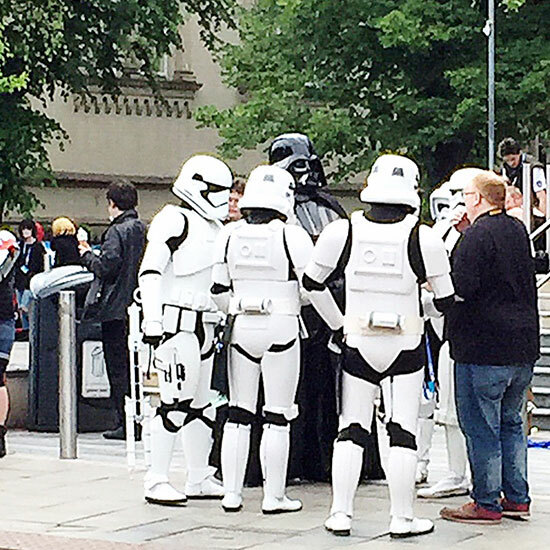 My first thought was that you went to some sort of Star Wars meet up! I've always heard about stormtroopers, but don't really know what they are. As for that sad piano---I'm sure it dropped off of someone's moving truck. Would that be considered littering? I wonder what the fine would be for a piano! !